Witness 40, Michael Brown: "Football player" witness unreliability, history of racism known to grand jury. 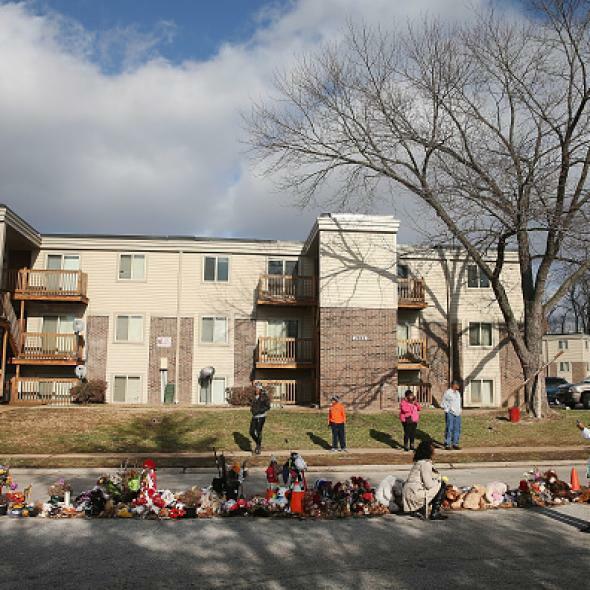 The memorial at the spot where Michael Brown was killed. A Smoking Gun piece posted Monday reveals the identity and checkered past of “Witness 40,” who likely lied while testifying to the Darren Wilson grand jury that Michael Brown charged Wilson “like a football player” just before he died. The Smoking Gun writes that Sandra McElroy’s testimony is “baked into the narrative of the Ferguson grand jury”; Gawker covered the Smoking Gun story by describing McElroy as “Darren Wilson’s key witness.” But while McElroy’s “like a football player” line has been repeated a number of times on Fox News, testimony transcripts themselves indicate that it’s unlikely that McElroy’s account was taken seriously by grand jurors. The Smoking Gun has collected information about McElroy’s past, including social media posts and court records, indicating that she has a history of dishonesty (including check fraud and a dubious 2007 claim to have witnessed an incident in another high-profile criminal case) and racial bias (including repeated use of racial slurs). All of it certainly casts serious doubt on whether McElroy was actually anywhere near Ferguson, Missouri on the day Michael Brown died. But as the Smoking Gun alludes to only glancingly, McElroy’s testimony was also extensively undercut by prosecutors themselves—in fact, a Washington Post writeup of grand jury evidence shortly after the decision not to indict Wilson referred to McElroy’s testimony as “discredited,” while a similar CNN recap made clear that prosecutors doubted the logistics of her story and questioned her about racist material she’d written online. As the Smoking Gun does mention, McElroy returned to the grand jury on Nov. 3 with a new story about why she was in Ferguson. In testimony in Grand Jury Volume 18, McElroy reads from a journal and attests that she was in fact travelling to the area to conduct personal research to help her understand black people (!). But the Smoking Gun doesn’t mention that, in those same grand jury records, a prosecutor says (in front of jurors) that McElroy had admitted she may have gotten details of her earlier testimony off the Internet, points out that her journal entry from the morning before Brown’s death is suspiciously detailed, and asks McElroy directly whether she may have made up or “dreamed” the events that she’s testifying about. Another prosecutor tells McElroy she believes McElroy is “confused” about her own account and grills her about her animosity towards blacks and her use of racial slurs. Given all this warranted skepticism expressed toward Sandra McElroy in front of grand jurors by prosecutors—and the incredibly obvious flaws in her testimony itself—it’s hard to believe that any sane juror, no matter how inclined to believe Darren Wilson, would have taken her testimony seriously. While the Smoking Gun’s investigation is useful in undermining those in the media who would take McElroy’s words out of context, it’s doubtful—given the evidence currently at hand—that the grand jury’s ultimate decision would have been any different had she never testified.